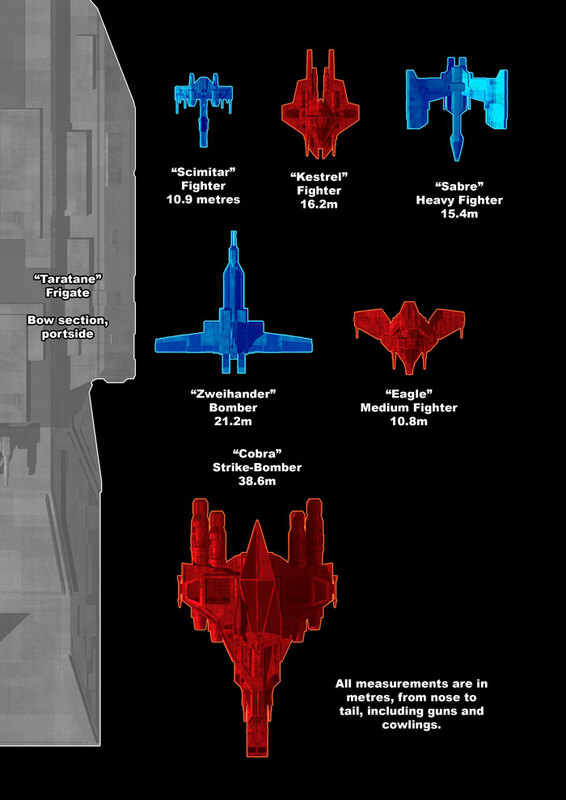 A scale overview of every fighter and bomber at White-Rim, plus part of a Taratane class Frigate for comparison. As you can see, the Scimitar is a remarkably small fighter - designed specifically for carrier-operations using cutting-edge technology. The Kestrel, by contrast, is an inefficient design sacrificing firepower and maneuverability for acceleration - it's close to becoming obsolete, but is likely to remain in service as long as it remains cheap and easy to mass-produce. The Eagle is a much newer design, a heavily modified Kestrel with much more firepower but not so much acceleration, but it's much more costly to produce. Sabres and Zweihanders don't look so good from this angle, as they have significant vertical elements in their design. Again, don't forget the contest, and the poll in the forums.